Director/Screenplay – Alexandre O. Philippe, Producer – Kerry Deignan Roy, Photography – Robert Muratore, Music – Jon Hegel. Production Company – Dogwoof/Exhibit A Pictures/Arte, G.E.I.E./Milkhaus/Screen Division/Sensorshot Productions. The last few years have seen a renewed fascination with Alfred Hitchcock and in particular Psycho (1960), now widely regarded as his greatest work. The making of Psycho was depicted in Hitchcock (2012), while Hitchcock’s life was also portrayed in The Girl (2012) and we had a Hitchcock cameo in Grace of Monaco (2014). Not long after, Peter Ackroyd released his acclaimed biography Alfred Hitchcock (2015). During this time, Psycho was also revived in the modernised origin tv series Bates Motel (2013-7). Alexandre O. Philippe is a director who mostly specialises in documentaries about fandom. He has previously made Earthlings: Ugly Bags of Mostly Water (2004) about Star Trek fandom; The People vs George Lucas (2011) about Star Wars fandom; The Life and Times of Paul the Psychic Octopus (2012) about the octopus that has made accurate predictions about the outcome of the World Cup; and Doc of the Dead (2014) about the zombie film phenomenon. 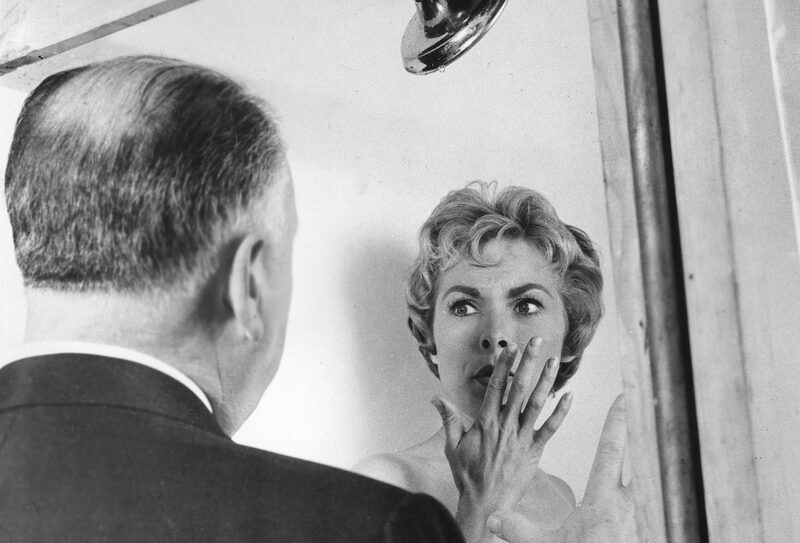 78/52 is documentary devoted entirely to an analysis of the shower scene in Psycho. (The title, which is never explained throughout, refers to the fact that the finished shower sequence contains 78 different cuts between 52 camera set-ups). We have had documentaries devoted to analysing various films before but this must be the first devoted to a single scene in a film (one that runs to just under two minutes in length). Admittedly, it is probably the most famous single scene in cinema history. (Although in a similar vein, Jean-Luc Godard did make Letter to Jane (1972), an entire film dedicated to analysis of a single photo of Jane Fonda). Not all of 78/52 is devoted to just the shower sequence – the earlier scenes spend some time giving context to the making of Psycho. I found these sections fascinating as they offered many intriguing insights into Hitchcock and his works that I had not heard before. Stephen Rebello opines that there was a recurrent theme running throughout Hitchcock’s films of how complacent and unprepared England and the US were when it came to World War II – something we see reflected in other works such as Saboteur (1942) and especially Shadow of a Doubt (1943) about the dark menace that lurks beneath the facade of the everyday. Others contrast how the black-and-white Psycho was a reaction against the lush Technicolor fantasies the Hitchcock was making in the 1950s with Rear Window (1954). To Catch a Thief (1955) and North By Northwest (1958) or how Hitchcock had become an easygoing and familiar figure on tv screens as host of Alfred Hitchcock Presents (1955-62). On the other hand, these sections do reveal the pitfalls of amateur analysis – something this site is always careful about straying into – such as when Rebello sees echoes of the troubles of the 1960s in Psycho and especially when Eli Roth compares it to Charles Manson. Hindsight always has 20/20 vision as they say but somehow one suspects that what the middle-aged, British conservative Hitchcock was rebelling against was a world away from what the hippies and 60s revolutionaries were. Discussion of the shower sequence takes up the bulk of the film. Others point out how symbolism associated with the scene looms throughout the rest of the film – between Norman’s face coming into frame disguised as mother and that of the highway patrol officer in sunglasses; between the falling water from the showerhead and the rain obscuring Marion’s vision on the windscreen; or the presence of a showerhead looming in the background as Marion packs to leave. Others even spend time analysing the painting that Norman has covering his peephole – Susanna and the Elders (c1660) by Frans van Mieris the Elder, based on an Old Testament story about lecherous elders trying to have their way with a woman after they see her bathing in a garden – and how this echoes the themes of voyeurism (a throwaway touch that I had not even paid attention to in watching the film). Mick Garris also points out that we had never seen toilets depicted on screen prior to this, while Stephen Rebello takes this back to the Victorian obsession with hygiene and spotless bathrooms, something that Hitchcock would have grown up with, and we see frequently shown in his films – in other words, we have a work here that violates the sanctity of that Victorian ideal. Guillermo del Toro fascinatingly taps into Hitchcock’s Catholicism and talks about how sin, punishment and retribution plays throughout his films. The bulk of the film is taken up with people analysing every single aspect of the shower sequence. This goes through an analysis of the cutting techniques, the camera set-ups, the musical score and sound effects. This is conducted in more detail that one ever thought possible from a viewing of Saul Bass’s storyboards to a replication of the choice of the right melon and steak used for the sound effect of the knife striking Marion’s body to an interview with Marli Renfro, Janet Leigh’s now 79 year-old body double, to discussion of some of the tricks required to get a showerhead to pour water directly at the camera without spraying the lens and how to black out the face of the actor playing Mother so that it was not seen. The film spends some time on but never bogs down in technical minutiae as I half anticipated it would. Indeed, the discussion of Hitchcock’s use of blank space, his choice of left and right camera angles, the sense of ecstasy on Marion’s face as she bathes are all discussed with a fascination that illuminates hidden meanings that each shot choice conveys in ways that one had never been given cause to stop and think about before. The final section of the film details the influence of the shower scene on everything from the giallo film to works like High Anxiety (1977), Dressed to Kill (1980) and The Funhouse (1981) to Jamie Lee Curtis discussing her decision to appear in a shower scene parody in tv’s Scream Queens (2015-6) without tarnishing her mother’s legacy, among others.